After an unsettled and cool end to July, August has continued in a similar vein. Many places have been showery and cool so far, with a southward-shifted jet stream to blame. This has directed areas of low pressure, which normally skirt to the north of the UK in summer, to instead move across the country. In between spells of rain or showers brought by these low pressure systems, there have been some drier, brighter days and sunshine amounts have been close to normal. However, temperatures have been a little disappointing, with no locations recording a temperature in excess of 25 °C up to 15 August. Provisional figures show mean temperatures have generally been below average for August by about 1 °C, but central southern England has seen the greatest differences compared to the 1981-2010 average. For south-east and central southern England the period 1-13 August 2017 has been the coldest since 1987. Interestingly, however, if you compare temperatures for this period to those experienced in the years 1961-1990 then it wasn’t so unusual to see such suppressed temperatures for the first half of August. In terms of rainfall, many places have seen more than half of the whole-month average already, with locations around the Humber and across parts of central southern and south-east England getting close to their month average. 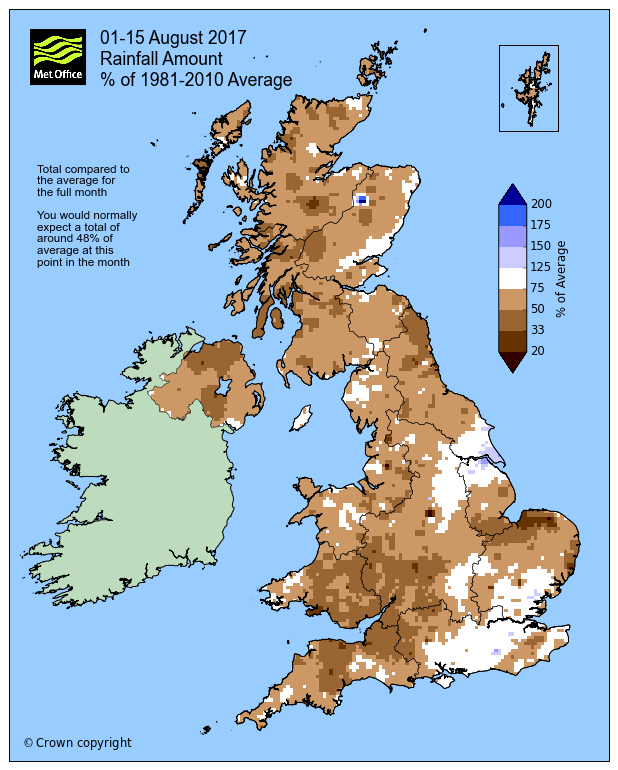 Up to 15 August, the UK has received 60% of the whole-month average for rainfall. Looking back over the last ten years, several Augusts have been wet over large parts of the UK, so the month does have a tendency to disappoint those looking for dry weather. 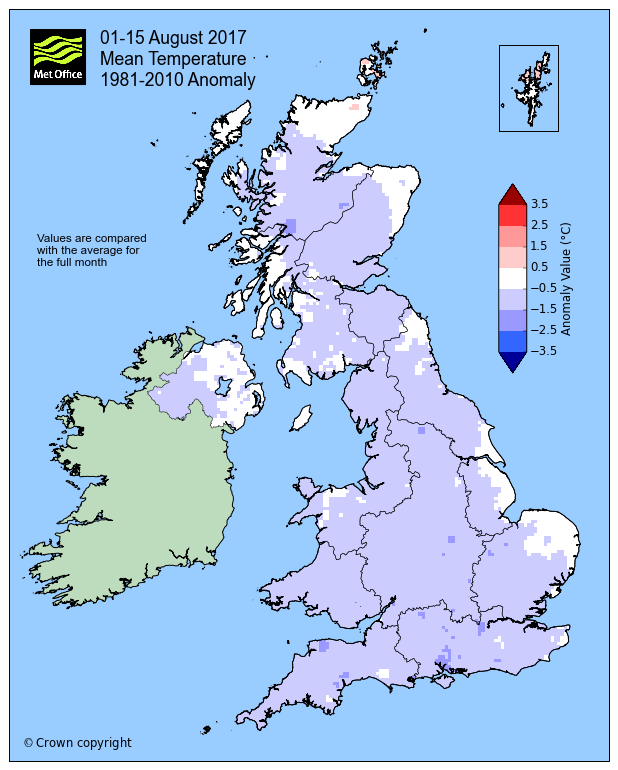 You can read weather summaries of previous months and seasons for the UK here. For the rest of August, it looks like the weather may settle down during next week, bringing some longer periods of dry weather with temperatures also recovering. However, low pressure is likely to bring further spells of wet and occasionally windy weather later this week and early next week. You can keep up to date with the weather using our forecast pages, on our popular mobile app which is available for iPhone from the App store and for Android from the Google Play store and by following us on Twitter and Facebook, as well as using. This entry was posted in Met Office News and tagged August 2017, rain, sunshine, weather statistics, wind. Bookmark the permalink.